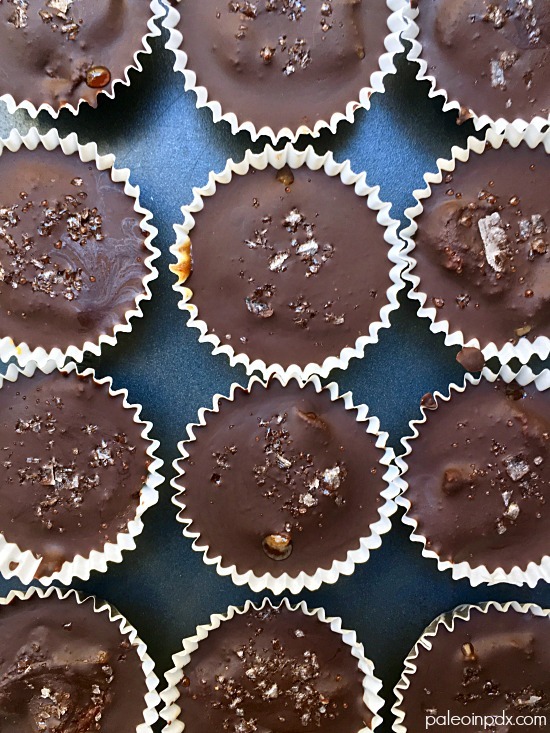 Halloween is getting closer and I thought it best to honor the holiday with these perfectly sweet pumpkin caramel chocolate cups. And, I gotta say…these are straight up divine. The combination of sweet, salty, and pumpkin spice flavors with a delicate bite and soft center is just right. It’s ridiculous, really. You will end up with a little extra date caramel, but luckily, there are many other ways to use it: spread onto dark chocolate squares, use as a dip for apples or pears, mix into yogurt, stir into nut butter, dollop on top of baked acorn squash or sweet potato, or simply eat with a spoon. By the way, I went back on KATU Afternoon Live yesterday and made my pumpkin spice chocolate clusters. These are another winning combo and great for Halloween as well! Watch the replay of my segment HERE. Also, if you can believe it, this month marked my one-year anniversary of going on the show! Add the softened dates to the food processor, along with the water, 4 Tbsp of the coconut milk, pumpkin puree, maple syrup, sea salt, pumpkin pie spice, and vanilla. Pulse to combine. If mixture still seems a bit too thick or chunky, add the remaining 1 Tbsp of coconut milk and blend again until smooth. Set aside. 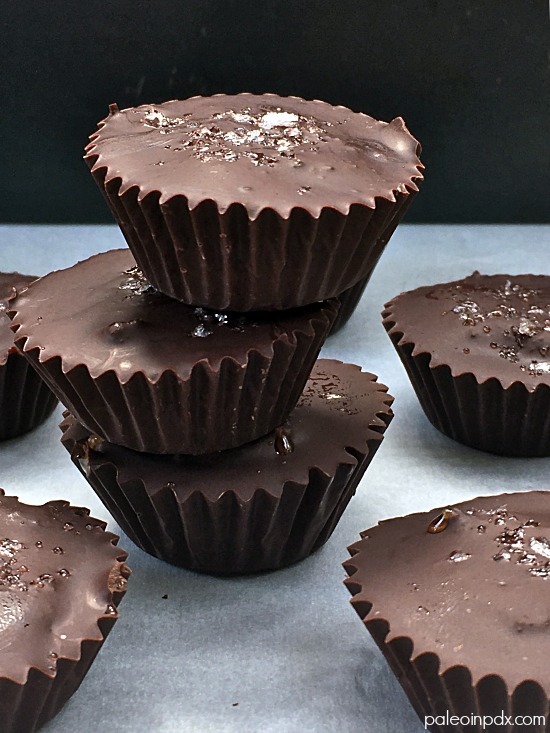 Melt chocolate in a double boiler over medium-low heat. Be careful not to get any moisture in the chocolate or it will seize! Once melted, stir in the coconut sugar and pinch of sea salt. Whisk until dissolved. Line a mini muffin pan with paper liners and add about 1 tsp of the melted chocolate to each liner. Then, add about 1 tsp of the date caramel to each and flatten out slightly (and gently) with back of spoon. Top each cup with another 1 tsp of melted chocolate. Garnish each cup with Maldon sea salt and place in fridge to set. If you want these to set faster, you can place in freezer. Store any leftover caramel in refrigerator and use within a week.